In 2001, Final Straw departed San Diego bound for Puerto Vallarta, Mexico with stops at Turtle Bay, Magdalena Bay and Cabo San Lucas. After a few months stay in Puerto Vallarta, we headed north to the Sea of Cortez making a number of stops along the way, including Mazatlan, La Paz, Loreto and Concepcion Bay. Final Straw stayed in La Paz during the late Summer and Fall of 2001. The yellow line depicts the route we took. A close up of this part of the trip may be seen on the map of Mexico below. In 2002, we sailed from La Paz to Puerto Vallarta. A few months later, we departed Puerto Vallarta, Mexico bound for New Zealand with stops at the Marquesas Islands, the Tuamotu Group and the Society Islands all in French Polynesia, the South Cook Islands, Beveridge Reef, Niue, the Vava'u, Hapai and Tongatapu Groups of Tonga and Minerva Reef. This voyage is depicted by the red line on the map above. In 2003, Final Straw was berthed at Bayswater Marina on the North Shore of Auckland. We spent this year touring the North and South Islands and flying home to San Diego for a rest from the rigor of cruising. 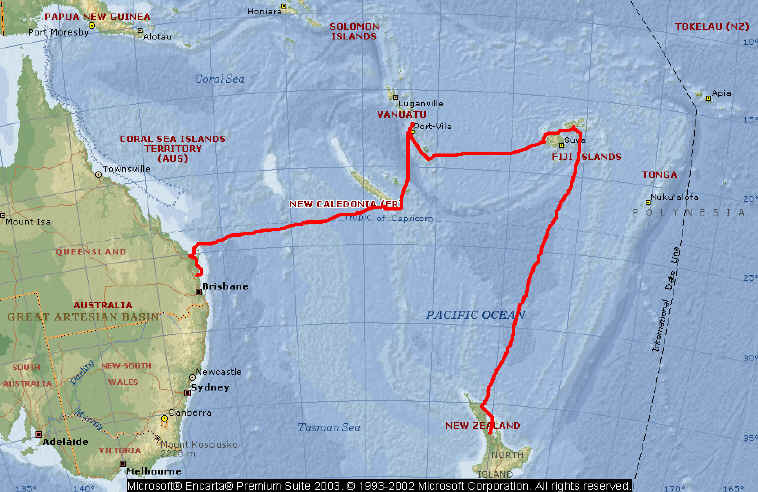 In 2004, Final Straw left Auckland, New Zealand via Kawau, Waiheke and Great Barrier Islands and Tutukaka bound for Opua in the Bay of Islands. After a three week stay waiting for a weather window, we departed for Fiji, Vanuatu and New Caledonia before arriving in Australia. The route sailed is depicted by the green line on the map above and is shown in greater detail on the map below. 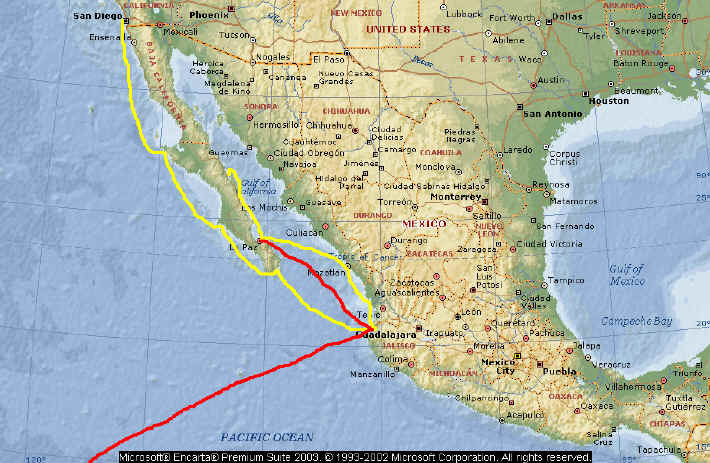 A closer look at our route around Mexico is shown below. 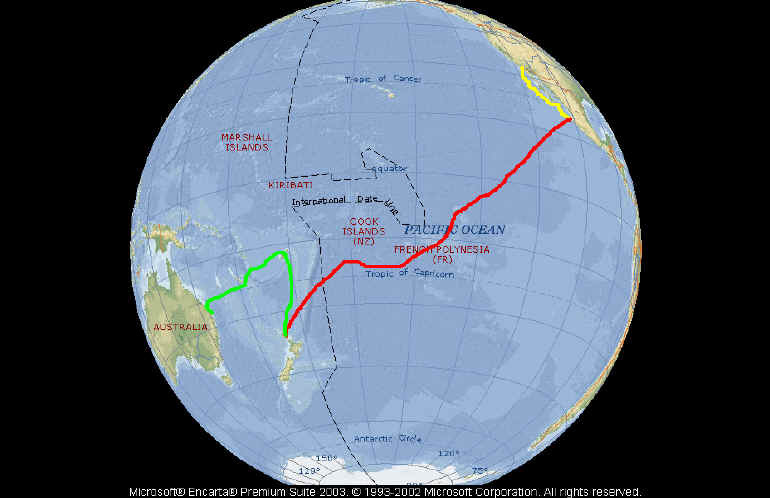 The yellow line was sailed in 2001 and the red line was early 2002.